The National Archives and Records Administration (NARA) is the nation’s record keeper. They hold the most important documents and materials created by the United States Federal government. In addition, the National Archives provides free genealogy workshops and free history activities. Here is what is being offered at the National Archives Washington D.C. facility in January of 2017. 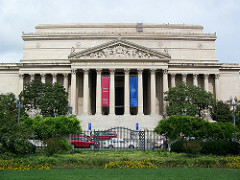 The National Archives Washington D.C. facility is called the Boeing Learning Center. It is free to visit and reservations are not required. You can view the original Declaration of Independence, Constitution, and Bill of Rights. It is also possible to visit the Public Vaults that showcase the holdings of the National Archives, organized thematically around the Preamble of the Constitution. There are several days in January of 2017 when you can attend an activity called Presidential Inaugurations. This activity is described as a family activity. People of all ages can attend. Children must be accompanied by an adult. Have you ever wanted to hear John F. Kennedy’s inauguration speech? Or see Ronald Reagan’s inauguration parade? Come to the Boeing Learning Center in January and engage in hands-on activities related to Presidential inaugurations. The Presidential Inaugurations family activity is available on January 5, 6, 7, 9, 10, 11, 12, 13, 14, 16, 17, 18, 19, 20, 21, 23, 24, 25, 26, 27, 28, 30, and 31. The Boeing Learning Center is offering the activity from 10:00 a.m. through 4:00 p.m. Eastern Time. In addition, the National Archives facility in Washington D.C. Will be holding some genealogy activities. They are free to attend. Some of the activities will be viewable on YouTube. Learn about various genealogy sources from Ray Bottofr, Jr., as he describes valuable information accidentally found in our records, including records regarding military permissions to marry, deceased military personnel, and military passenger lists. This is a two-part series. Ray Bottorff Jr., returns to describe valuable information accidentally found in our records, focusing on records from the Selective Service System. Presentation materials area available through the National Archives website. Not sure where to begin? Has a genealogical problem stumped you? Archivists Claire Kluckens is available from noon to 4 p.m. To answer your questions. Sign up for first-come, first-served 20-minute appointments.